These might be used for Eskimo dancing. This King Island mask represents a woman, her hair parted for braids. It was acquired with two male masks as a set, all probably made by the same artist and used together. Its meaning within King Island’s rich heritage of dance and ceremony has not been identified. For the “Competition Dance” men wore women’s clothing and masks to hide their faces, and women danced disguised as men; it seems possible that this mask was used for that purpose. Branson Tungiyan: Females have that when they braid their hair. Branson Tungiyan: The red brow is female. 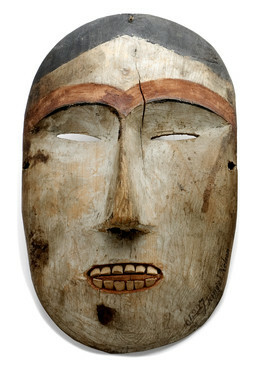 This female portrait mask, purchased on King Island by Smithsonian collector Edward W. Nelson in 1882, has not yet been specifically identified by contemporary Elders. In the book King Island Tales, Frank Ellanna of King Island described some of the many songs and dances that people of this Bering Sea island traditionally performed during mid-winter, or Sauya.tuġvik [the Time of Drumming]. (1) For the “competition dance,” men wore women’s clothing and masks to hide their faces, and women danced disguised as men; it seems possible that this mask was used for that purpose. Dancers wore different types of masks and special regalia for the Wolf Dance, Polar Bear Dance, and other performances. (2) When not in use, masks and drums were hung up in the qagri [community house] . (3) Masks were used throughout the Iñupiaq region for the Messenger Feast, whaling festivals, and other social and religious ceremonies. (4) The King Island Singers and Dancers, Northwest Iñupiaq Dancers, and other groups carry on the traditions of Iñupiaq dance.